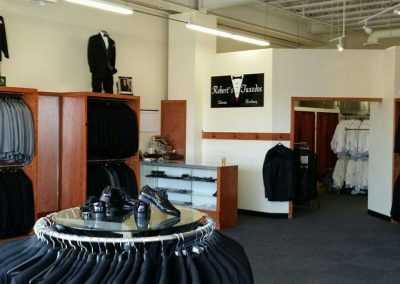 Established in 1984, Robert’s Tuxedos specializes in formal apparel for men, women and children. We are located on Route 46 West in Totowa, New Jersey next to Lens Crafters (in the Holiday Inn Complex). We are family owned and operated and in 2014 we celebrated our 30th anniversary in business. We have a huge referral network, meaning our reputation in this area is unsurpassed. Robert’s Tuxedos is fully stocked with everything tuxedo. Slim Fit and Modern Fit tuxedos in many styles are available. Most tuxedo rental stores have just a few sample jackets, nothing to try on, and employees that are simply salespeople. At Robert’s, all of our employees help put together your order, so they know how things fit and how they are supposed to look.